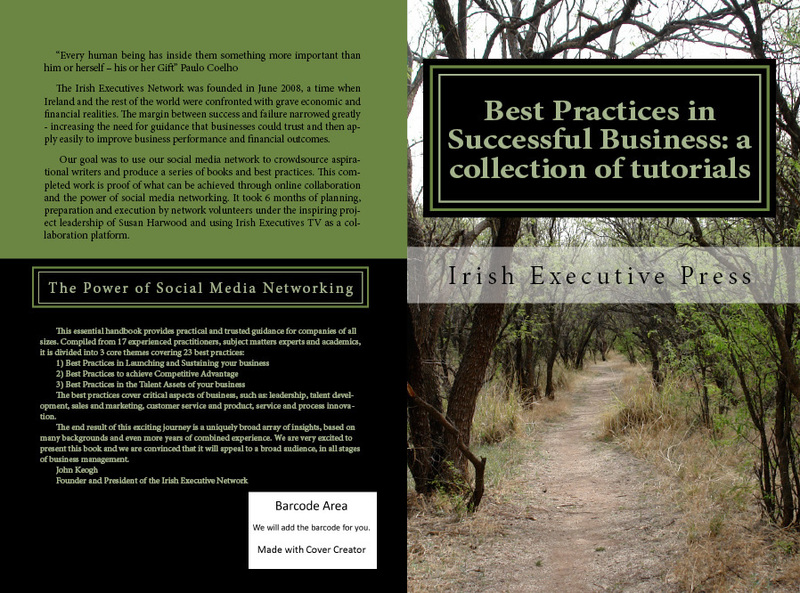 Patricia Ryall, Principal, contributed a chapter to Irish Executives (IE) first press publication “Best Practices in Successful Business: a collection of tutorials” which was launched at the Irish Executive Network summit, in Galway, September 2012. Patricia’s chapter entitled Leveraging Cultural Diversity, is aimed at leaders and organisation dealing with increasing cross cultural diversity in the workplace and is one of 23 best practices chapters in the book. Other topics of interest in the IE book include leadership, talent development, sales and marketing, customer service and product & service and process innovation. As one of the first IE authors, Patricia spoke at the IE conference on managing cultural diversity whilst others including Chris Couglan, HP Cork, John Ryan of ‘Great Place to Work’, Kingsley Aikins, former head of the Worldwide Ireland Funds spoke on Leadership to Innovation in product, service and process and Thought Leadership in Health and Wellness. Global SVP at PepsiCo, John Philips, was the keynote speaker. The Irish Executive Network was formed in 2008 and is Ireland’s largest global social media network for business leaders. The annual summit event is centered on leadership, networking and driving innovation to get Irish business moving again. Irish Executives is a social media network that was formed on LinkedIn in June 2008, dedicated to connecting more than 16,000 business people within Ireland (72%) and around the world (28%). As the global economy has put pressure on Ireland, Irish Executives continue to respond with a commitment to sharing ideas, insights, expertise and connections that exist among the Irish Diaspora at home and abroad. Irish Executives is an independent, neutral, non-political and not for profit networking group for the global Irish Diaspora Irish Executives was founded by John G. Keogh, a Toronto-based executive from Galway City, who drives the group’s strategy, operations and growth. Director and founder of Dúchas Coaching and Training in 2001, Patricia is a seasoned executive coach and trainer.